All about car batteries can be found here. We are approaching the season when countless drivers curse their batteries. Especially cold temperatures put an extra strain on the batteries - sometimes they let you down due to age, or sometimes due to lack of maintenance. What you need to know about buying and maintaining a car battery, Bourne Car & Van Hire tells you here! We offer our fast, safe and convenient battery service to our customers, so you don't need to worry about anything. 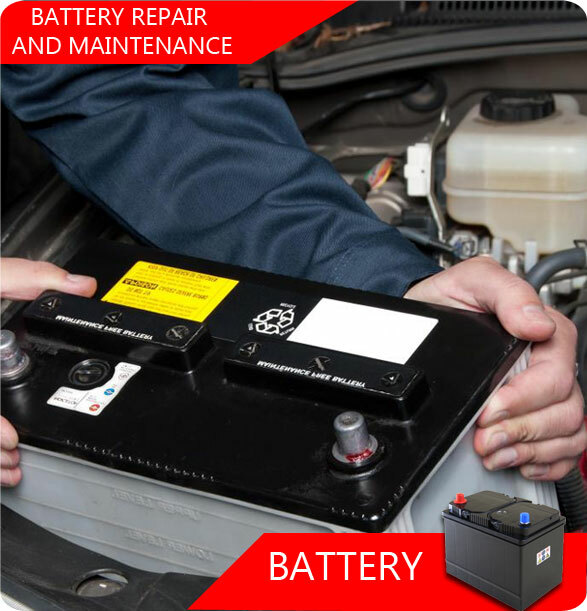 We will make sure you will get the perfect battery fitted in your car. Most of our customers come to buy their vehicle's new battery from us and get them fitted by us. If you want to change the battery yourself, please have a look at our little information page. We hope you will find it useful. They are overcooled and overheated, shaken and stirred: car batteries are subject to wear, and eventually they give up. The average life expectancy is five to six years - then a charger might help but only for a short time, and a new battery must be bought eventually. First of all, check the owner's manual of your vehicle. Here you will find any specifications of the manufacturer regarding a new starter battery. Be sure to follow these guidelines! Look for important features of the old battery and see what the voltage (in Volts, V), cold-start (in ampere, A), and rated (ampere-hour, Ah) ratings are. If you were satisfied with your previous battery, follow this information. It is also important that the new battery fits the connections and dimensions of the bracket in your car. New battery models often have a European Type Number (ETN): this number describes rated voltage, cold-start current, capacitance, design and position of the poles. Batteries with identical ETNs can be easily exchanged with each other. Calcium (Ca + / Ca): This type of battery is now used in most new cars. They are characterised by low water consumption and low self-discharge rate. Calcium batteries are particularly suitable for installation in the engine compartment, where high temperatures prevail, or in hard to reach places. A disadvantage - especially for cars with start-stop function - is the low cycle stability. This means the battery withstands less loading and unloading. Low Antimony (Antimony + / Antimony): These batteries have high cycle stability but consume significantly more water. They are hardly used as a starter battery. Hybrid (Antimony + / Ca-): Hybrid antimony and calcium batteries consume more water compared to pure calcium batteries, so now and again you need to add distilled water. For the hybrid battery is more cycle-stronger than the calcium variant. Commercially available both fully charged and charged batteries and dry pre-charged batteries are offered. The latter type reaches its full power only after a few loading and unloading. Normally, you access the filled battery; Only if you need a rather rare type of battery and may need to store it for a long time, the dry variant is the ideal solution. Care of the car battery: You should know that. Even though most batteries today come with the rating "low-maintenance" and "maintenance-free", an occasional look under the hood and on the battery does not hurt. Make sure that the battery is always clean and dry. Otherwise, leakage currents may form which additionally discharge the battery. The cable connections at the battery poles should be regularly checked for tightness. If the connections are dirty, clean them and apply sparingly with special fat. The battery must be firmly seated in its holder, otherwise tighten the screws. If the battery is mechanically damaged or leaking, it must be replaced immediately! For starter batteries with sealing plugs: check the fluid level regularly, if necessary top up with distilled water to the maximum mark. In the warm season, a certain water consumption is normal. However, if the battery is noticeably "thirsty", the charging voltage supplied by the regulator may be too high. In this case, come to see us at our Bourne Car & Van Hire workshop. Batteries without plugs belong to the so-called maintenance-free types; you do not need to check the liquid level with these batteries. In our garage, we check the ageing- and charging behaviour of the regular vehicle service appointments. Not only does Bourne Car & Van Hire offer a lot of different services around vehicles, but also inexpensive and high-quality car batteries - so your car will not start to "stutter" again anytime soon! If you have any questions or need help finding the right battery for your vehicle, please get in touch with us.